Tag: The Power of Paint delivers an innovative approach to multiple genres - platformer, puzzle, and first-person shooter - by allowing the player to manipulate the physical attributes of the game's environment using different colors of paint. Each color has an attribute linked to it, such as speed boosts or wall-walking. 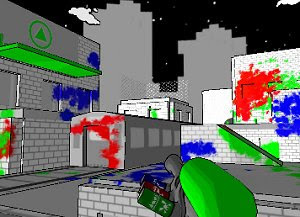 Touted by the creators as “a first-person puzzle platformer which focuses on the players”, Tag offers an endless supply of paint to experiment with, allowing for a gameplay where the only limit is the imagination. Tag is an acclaimed game that is widely considered a compelling work alongside Narbacular Drop, the precursor to Valve’s Portal and another DigiPen produced game.